Helpful Tips - African Violet Society of WA Inc.
Collated from articles published in various magazines. Start with healthy plants that are good growers and good bloomers. Visit African violet shows to find out which varieties do well in your area. In Perth you know where we are. Isolate all new plants and any plants that are returning from a show for at least one month. If possible, keep these plants in a separate room that is as far away as possible from your other African violets. Many African violets are killed each year from over-watering. African violets do better if they are kept moist, not too wet or too dry. If you see light-coloured specks on leaves and stems, or white cottony masses, you might have mealy bugs. When there are only a few, use a cotton swab, dipped in rubbing alcohol or metholated spirits to kill and remove them. Before you use it, bake your soil to kill any nematodes, weed seeds, fungi, and insects that might be in it. First, preheat your oven to 100 degrees. Then place a pan of soil, with a thermometer in the centre, into the oven. Continue baking for thirty minutes. Microwaving is also good but the time depends on the power of your microwave? Put a layer of coarse perlite, pieces of broken clay pots, or other materials at the bottom of your pots before you add the soil. This provides more oxygen for the roots and helps the soil to drain faster. A little perlite can also be added to the soil, if needed. The AVS-WA mainly uses wick watering and a mixture of peatmoss and perlite. Flea collars are a safe method to repel or kill insects, cut into piecesand placed between your violets and can prevent the hazard of spraying poisons in a confined area. The largest size is usually the best. Soak dirty pots overnight in a solution of water, bleach, and liquid detergent so you won't need to do as much scrubbing to get them clean. I have all my teeth but I know that Polident, (a denture cleaner) is just great. Put a few tablets in a bucket of very hot water then add the dirty pots. You can also add a few drops of liquid soap. ​Some of the African violets stress a little and tend to grow suckers. 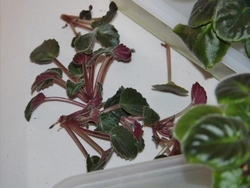 This is a chance for you to try out the skills of extracting them where they hide near the base of the plant among the peduncles, you can then pot them on as they are also called plantlets.